Now we know that if the earthly tent we live in is destroyed, we have a building from God, an eternal house in heaven, not built by human hands. Meanwhile we groan, longing to be clothed with our heavenly dwelling, because when we are clothed, we will not be found naked. For while we are in this tent, we groan and are burdened, because we do not wish to be unclothed but to be clothed with our heavenly dwelling, so that what is mortal may be swallowed up by life. Now it is God who has made us for this very purpose and has given us the Spirit as a deposit, guaranteeing what is to come. Therefore we are always confident and know that as long as we are at home in the body we are away from the Lord. We live by faith, not by sight. We are confident, I say, and would prefer to be away from the body and at home with the Lord. So we make it our goal to please Him, whether we are at home in the body or away from it. For we must all appear before the judgment seat of Christ, that each one may receive what is due him for the things done while in the body, whether good or bad. I just received a Caringbridge notification. The verses I have shared with you are the first verses I read this morning as I wiped the sleep from my eyes as I read from Paul Lowry's journal for Sharon. I want to quote Paul. "Sharon is with our LORD. Very early this morning (Wed 8-25-2010) Sharon peacefully departed her body for her destination with the Father. Sharon did not lose her battle with cancer because you cannot lose something that has already been won. Death has no power over us for we are eternal because of what Jesus Christ did for us." Please continue to lift Paul and his family in prayer as they go through the days ahead. 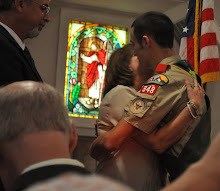 On Saturday evening, Aug. 21, 2010, at 7pm, the Eagle Scout Court of Honor convened and our son, John was awarded the rank of Eagle Scout. It was a beautiful candlelight ceremony held in our church, attended by 75 friends and family. Until that night, John didn't know I had written the poem I am sharing with you tonight. My part in his ceremony was a surprise for him. I spoke privately with the Master of Ceremony shortly before the court convened and shared with him that I wanted a moment at the podium. Coming from a person who is not known as a public speaker, I shared my poem, bringing emotion and tears to the eyes of some as they listened to a mother's heart being spilled out before God and everyone present. Allen's dad, John's Grandpa, who is also an Eagle Scout, presented John with the Eagle Scout award. I wrote the poem January 9th, before John went before the Eagle Scout Board of Review, with Paul Lowry in attendance in the board room with John. We owe Paul a great debt for his devotion and dedication to scouting and his trememdous support of John. Paul was unable to attend the ceremony as he is constantly by Sharon's side. Be sure to take a look at the photo I have included for you of John and I in an embrace with my Allen looking on in delight. Our pastor opened the ceremony with a word of prayer and lifted up Paul and Sharon as they continue in need of prayer. You search my mind and my heart. My innermost desires have always been known to You. How great the blessings You have bestowed upon me. My soulmate, my daughter and my son are priceless and cherished. I praise You for the blessings of family and friends. for the blessing of my son in my life. instruct him in the way he should go. compassion, and strength of character. May his integrity never be breached. on level ground all the days of his life. I trust You, oh God, to fulfill Your purpose for his life. he wants to do, love him and forgive him when he fails you. My son is a heritage from You, Most Precious Lord. May he always and forever be secure as he daily puts his faith in You. He knows his life is in Your hands. Mould him and shape him into the man he is becoming. Your promise preserves his life. Keep evil far from him. keep a hedge of protection around him. Lord, my son is a delight to my soul and he gives me peace. My heart sings as he wraps me up in a tender embrace of love. Lord, give him wings to soar with the eagle. Direct his steps in the way he should go. Shine Your light into his inmost being. Use his life as an example of Your unfailing love. being polished by my Lord and Savior. and his actions are pleasing unto You. Heavenly Father, in You, I put my hope and my trust. of my life. You are worthy, Lord. You are worthy. My mind and my thoughts are focused on Paul and Sharon Lowry and their family this morning. Many of you have joined me in continuing to lift them up in prayer as they live through this difficult time since Sharon was diagnosed with brain tumors this past February. I received a Caringbridge notification last night that Hospice has been called in to serve their needs. Even in their times of weakness they have been strong. They have been such shining examples of faith, hope, and love to all whose lives they have touched and will continue to touch. God speaks to us through them in the way they live the verses I have included today. That's what they do. They live as they have been taught to live according to the Holy Word. I have such great respect for them. 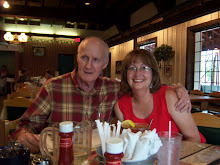 They personify the poem I wrote in December 2005 I am sharing with you today. They understand what life is all about. They have devoted their lives to sharing God's love. They know sharing God's love gives Him pleasure. They have pleased God in the way they daily live. Their lives are truly examples to others. They have been willing to adapt and adjust and I know they have done so with happy hearts. They have accepted God's will. They are being examples to you even though you don't know them personally, because you know them through me and what I am sharing with you about their lives, their love, their weaknesses and their strength. But above all, give their suffering a special meaning as you draw closer to God. Yes, there is a degree of suffering we can't deny. But there has also been such an outpouring of love and devotion that goes beyond words to express. You never know what an encouraging word can accomplish! Thanks to a lady named Michele who took the time to send me an encouraging email today and thanks to a fellow poet, Reason A. who sent me a timely comment and link to a poetic site, God created, through me, a poem whose origin I just discovered today! God is love and God is the Alpha and the Omega. God's love is an eternal flame. With His heavenly breath, He blew into us the breath of life and with that, He lit an eternal flame within each of us. As you encourage another person, the words carried on your breath perform a miracle. We are truly never without hope. God created us in His image and in so doing, lit our eternal flame. We simply must fan the smouldering embers of another person's eternal flame when it dies down and is seemingly nothing but a pile of ashes. Though these ashes appear dead and useless, an encouraging word may be all that is necessary to create a spark that sets the flame aglow once more. My earthly body is temporary. One day, I will take my last breath as a human being. My soul and my eternal flame know no boundaries of space and time. When I am gone, don't mourn my passing. Rejoice with me, instead. When you think of me, my eternal flame will glow inside of you and warm your heart. This form of poetic expression is called Rhopalic verse. It can be very deceptive, in that it appears quite simple. However, much time and deliberation are necessary in order to transform thoughts into a poem that is pleasing to the ear and to the soul. The syllables of the words in each line are one, two, three, four, etc.